As I delve deeper into my acquaintance with Bollywood films, I find it increasingly apparent that few of them are entirely embraceable because their disparate nature forces you to take elements that you don't like with whatever it is that thrills you. Certainly, Sanjay Leela Bhansali’s Devdas has some components that irked me, but overall it’s an eminently watchable feature, and it’s certainly better than the Bollywood Crouching Tiger, Hidden Dragon that is Lagaan, if for no other reason than because it lacks an hour and a half cricket match. Telling a timeworn story that has been the subject of several previous Bollywood epics, Devdas opens when the titular character (Shahrukh Khan), whose name apparently means “Tempest”, returns home to India after an absence of ten years. We find that Paro (Aishwarya Rai), his childhood girlfriend still pines for him, and has kept a lamp lit in his honor for the previous decade. The exciting and buoyant first musical sequence, prompted by the prospect of his arrival, shows Paro and her attendants as they dance in joy at news of his return, while maintaining the lantern’s flame. Before long, however, their bliss is interrupted as the pressures of the caste system and familial bonds weigh down upon their happiness. 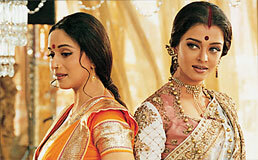 Devdas develops into a full-bodied tragedy, as its lovers’ passions remain unrequited. Most of the audience would be entirely familiar with this story, though, I imagine, so the excitement naturally comes from the plot (eventually, when it interrupts a song and dance so that its protagonist can have a cirrhotic hemorrhage, it turns into something resembling a Bollywood Leaving Las Vegas), but from the stylish execution. This is one of the largest Hindi productions ever mounted, and the budgetary excess is all shown on screen. The set design in particular is stunning. Color abounds everywhere here, from the rainbow saris and costumes, to the stained glass windows that decorate the elaborate mansions, to the flowers and incense used in the dances. Even in Devdas’ most scattershot moments, Bhansali gives us something stunning to look at. It might not be a better film than his Khamoshi, but it’s certainly a more attractive one. Several of the performances here are solid, especially from the female cast members. Madhuri Dixit, as Chandramuki the prostitute with the heart of gold, is the clearest standout, and when she and Paro finally have a dance number together, it provides what’s clearly the best sequence of the film. Khan is fine, if a bit generic, as Devdas. His romantic scenes feel somewhat obligatory, and the only moments in which his character comes alive are when he argues with his father, a lawyer, and uses legal terms like “I object!” When a movie throws as much at you as Devdas does, however, it’s difficult to object to minor disappointments.